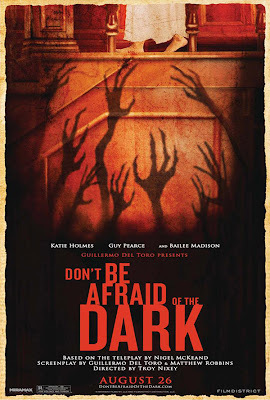 This week’s episode of Out Now with Aaron and Abe probably will not require the lights to be on, as it is not very scary; much like the main feature of the week – Don’t be Afraid of the Dark, the new haunted house thriller from producer Guillermo del Toro. Joining Aaron and Abe in their discussion of the film is friend of the show Adam Gentry, who did not actually see the film, but more or less happened to luck into this week’s episode and participate in the discussion anyway. Along with the feature review, the other regular segments of the show are present as well, which includes box office talk, a discussion of a few movie trailers (Immortals and Straw Dogs), a retro review discussion – which is very Guillermo del Tor centric, games, and some other fun stuff. Of course, in addition to this episode, there are many more episodes to be found on iTunes, as well as on the hosted site, The HHWLOD Podcast Network, and still at outnow.podomatic.com for mainly the newest episodes and some exclusives. One can also learn more at the official Facebook page for Out Now, facebook.com/outnowpodcast (“like” it), which features updates from Aaron and Abe’s personal blogs, other random posts, and some photo albums. Finally, feel free to e-mail the show at outnowpodcast@gmail.com with any sort of feedback or add an iTunes review.